U slot segmented blades are designed for cutting hard brick and pavers, mainly used on the light weight masonry saw. The wide U slot can provide a fast cutting and excellent cooling. It can be used wet or dry. Designed for cutting hard brick and pavers. Wide U slot can provide a fast cutting and excellent cooling. Segment height .395"(10mm). Arbor 1"- 20mm. Size is 14"x.125"x.395"/10mm. View More In Saw Blades, Parts & Accessories. If you have any questions about this product by WHIRLWIND USA, contact us by completing and submitting the form below. If you are looking for a specif part number, please include it with your message. 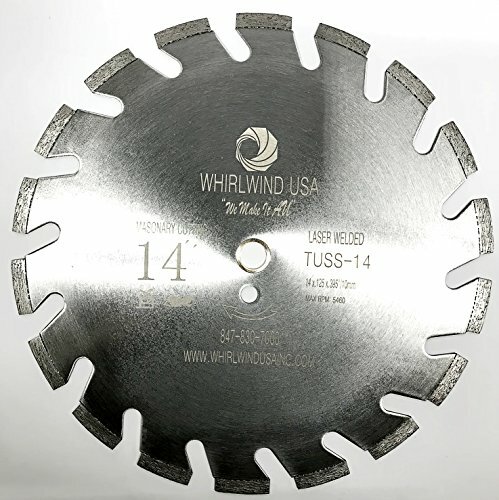 CMT USA, Inc. JS1617K-5 CMT 3 TPI HCS Reciprocating Saw Blades for Wood (5 Pack), 11"
CMT USA, Inc. JS1243HM CMT 2 TPI Carbide Reciprocating Saw Blade for Bricks, 10"